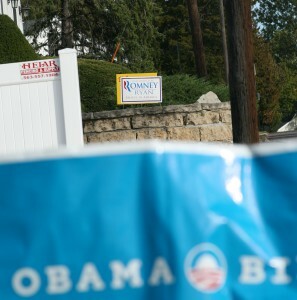 A Romney flier torn up in Iowa City, and an anti-Obama sign in Dubuque, Iowa. (Photo illustration by Emily Hoerner). With Rush Limbaugh’s bellowing conservative voice energizing millions or Neal Conan’s “Talk of the Nation” drawing liberal callers to National Public Radio, the U.S. seems locked in a political and cultural war. On one side, liberals supposedly have declared war on religion;on the other, conservatives are accused of launching one against women. Tune into liberal Rachel Maddow or conservative Bill O’Reilly on cable television, and you will hear more of the same. The rifts over abortion and gay rights and the red-state-blue-state division seem to support the notion that America is experiencing a clash of cultures. This divisiveness played out in real time in Congress last year between Republicans and Democrats. The two parties couldn’t see eye-to-eye on a routine vote to raise the debt ceiling, bringing the country to the brink of financial disaster and causing the first credit rating downgrade in American history. With so much reassurance, this “culture war” has become conventional wisdom. But is the war real? While experts in the field debate over differing degrees of polarization, few — if any — say the public is in the midst of a vitriolic war of cultures. A number of political scientists even believe the masses aren’t polarized. 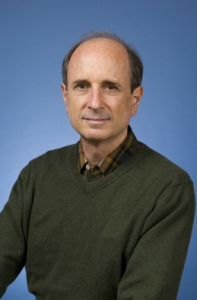 Samuel Abrams, a political scientist at Sarah Lawrence College and co-author of “Culture War? The Myth of a Polarized America,” said the public is not more polarized than it was in the past, in major part because the public isn’t paying enough attention. In a typical non-presidential election, turnout is around only 33 percent, he said. And with only one-third of the electorate participating, we aren’t doing so well as a democracy. Because the masses aren’t paying attention, more extreme candidates run and get elected. We haven’t consciously done it, but we have allowed it to happen, Abrams said. “If only 30 percent of the population voted in 2010 — and most of those people were elites or purists — it is no wonder we are getting crazy people elected,” he said. Abrams said low voter turnout characterized America since the 1950s, and the migration of citzens to the suburbs created an anonymous social system. As a result people have tuned out, he said. And when voters know less, they look for cues from people who know more. John C. Pierce, a political scientist at Kansas University who studies public opinion and alternative energy issues, said most people have some level of political knowledge. But because the issues debated in government are usually complicated — like the Patient Protection and Affordable Care Act — the public simply cannot grapple with the complexity. People search for other mechanisms that substitute for knowledge at the individual level,” Pierce said. Mechanisms like interest groups and parties. Surveys from the 1960s to 2008, conducted by the American National Election Studies, solidify that idea. Since the 60s and 70s, interest in public affairs remained near consistent rates, even slightly declining. But during the same period, party identification intensified as the number of survey respondents said they ‘care a good deal’ about which party won presidential elections had increased by 15 percent in 2008. So respondents identify and care about parties more, without paying more attention to the news. Although America’s commentators explain the culture war in black and white terms, the line dividing the opposing sides sometimes blurs among the more informed, putting them in alliances with people on the opposite ends of the political spectrum. For example, rational thought assumes environmentalists would be supportive of alternative energy. Pierce said, however, some environmentalists are opposed to wind energy, because they don’t like the aesthetics or other possible impacts on the environment, like birds getting caught in the propellers. “There are a lot of strange bedfellows out there,” he said. But the same isn’t true of the politicians. Academics generally agree politicians are dedicated to their party, and vote with them most of the time, said Julianna Pacheco, assistant political science professor at the University of Iowa. Pacheco said things have become more polarized at the elite level since President Lyndon B. Johnson occupied the White House from late 1963 to 1969. Democrats were pushing economic issues at the time, a strategy that embraced social conservatives who were economic liberals. “Then, LBJ came out for civil rights and split the Democrats.” Over the years southern Democrats switched to the Republican Party, Pacheco said. The 1972 re-election campaign of Richard Nixon exacerbated the divide. It inaugurated a strategy that focused on identifying supporters and getting them to the polls on election day, Doug Wead, a presidential historian and former special assistant to President George H. W. Bush, said in an email. 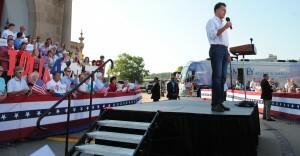 Mitt Romney in Davenport, Iowa. (Photo by Guannan Huang). “It was so successful that all campaigns have followed this ever since,” he said in the email. Today the focus is put on winning over the smaller, undecided middle. For example, presidential candidate Mitt Romney’s “47 percent” comments to a group of supporters revealed a political strategy to ignore a segment of the country — the leaning against and opposed — and tries to win over the small percent of undecided voters while rallying their committed identifiers. Aside from campaign strategies, Colin Gordon, a UI history professor, said you can also see major divisions between the parties begin during the economic turning point in the 1970s when the first trade and fiscal deficits replaced years of constant economic growth. That’s when people began seeing government spending on welfare programs as expenses that came out of their own pocket. “[President] Reagan was the first national politician to play this ‘us versus them’ card,” Gordon said. He said Reagan saw liberal initiatives as creating welfare queens and parasites of society. Kyle Mattes, an American politics assistant professor at UI, said this in-group versus the out-group tactic is in common use today. And this strategy is amplified by the Internet and partisan news like MSNBC and Fox News with the declaration of the “culture war” among the public. Social media — like Twitter and Facebook — are especially relevant to the polarization debate, according to Dietram Scheufele, a life sciences and communications professor at the University of Wisconsin-Madison. “(Social media) allows us as citizens to really create a filter, an echo chamber, around us,” he said. Scheufele said a large portion of the public is seeking news from social networking sites. Now they run into stories they never would have seen otherwise. So, in theory, these sites are widening the horizons of the people using them. But in practice, it doesn’t work quite like that. But seeing things that reinforce previously held views don’t make people more liberal or conservative. Natalie J. Stroud, author of “Niche News: The Politics of News Choice,” said in an email that looking at like-minded media causes people to become more favorable of their own candidate, and less inspired by the opposition. However, she said, that doesn’t mean they are flocking to either end of the ideological spectrum. “But they do seem to become a little bit more attitudinally polarized,” Stroud said. Although the Internet may be a filter, it still holds vast amounts of information that’s cheaply and easily accessible. “Which is a paradox, because people aren’t necessarily more informed,” Scheufele said. In fact, he said that the number of independent voters ironically has grown over the past 30 to 40 years. But John Zaller, a University of California, Los Angeles, political scientist who studies public opinion and elite accountability, warned that independents may not be an accurate gauge of polarization. People who register as independent and undecided voters usually lean toward one party or the other, he said. At any given point only about one-third of independent voters are actually independent. About 35 to 40 percent of the electorate is committed to each party, even in past elections. Nobody, not even President Franklin D. Roosevelt, has gotten much more than 60 percent of the vote, Zaller said. According to an American National Election Studies (ANES) survey, the number of true independents has remained near 11 percent since the 1960’s. Numbers of respondents who consider themselves independent, but who lean toward one of the two major parties, have grown steadily. This is attributed to the larger number of independents overall. Although identification with each party is stronger now than in the past, that might not prove polarization either. More Polarized, or More Identified? But not all experts agree. Some, like Keith Poole, a political science professor at the University of California, San Diego, said the public is more separated now than in the past and that data from public opinion polls show this increased polarization. Marc J. Hetherington, a political scientist who studies the U.S. electorate, also said the public has begun to reflect the polarization in Congress. However, citizens aren’t nearly as separated as elites. Hetherington said if the elite operatives had not become more polarized, the public wouldn’t have either. But others believe the relationship between leaders and the electorate is inversely related, because the voters elect the polarized politicians. Thus, through representation, the public chooses polarized candidates. Chris Warshaw, a political scientist at the Massachusetts Institute of Technology who researches representation, said voters and their elected officials don’t feel differently on most issues. “Basically, what I find is that the vast majority of the time the legislatures vote the way the people in their partisan base want them to vote,” Warshaw said. His research looks at the average opinion of a district on an issue, then compares it to the elected official’s roll call vote. Warshaw said his data lead him to believe there is a high level of polarization among the public. “It looks like, on most issues, legislators aren’t more extreme than their partisan base,” he said. And data from Poole, measuring “warmth” towards members of your own party versus members of the opposition party, shows colder feelings of the opposition in recent years. Which might be the way, at the elite level at least, the two parties are unable to compromise on much. Zaller said the public isn’t pleased with its elected leaders’ partisanship. “The public is fed up with Congress for being partisan. That doesn’t get very many [of them] defeated though,” he said. While the question of whether the public is more polarized — and even extreme — continues to be debated, Zaller said he has moved on. During a lecture at the University of Iowa he mentioned in passing that he had tired of studying public opinion because it no longer was interesting. Public officials, he said, are not responsive to the public anyway. “Path to Polarization” is a three-part series by IowaWatch assistant editor Emily Hoerner that examines modern-day polarization in American politics. Hoerner did this project as an honors journalism and mass communications student in her senior year at the University of Iowa. Check out the blog she kept while researching and reporting this story.